Treetopia Valentine's Day Wreath Blog Hop and Giveaway! I don't know if I've mentioned it lately, but we've been super duper busy. 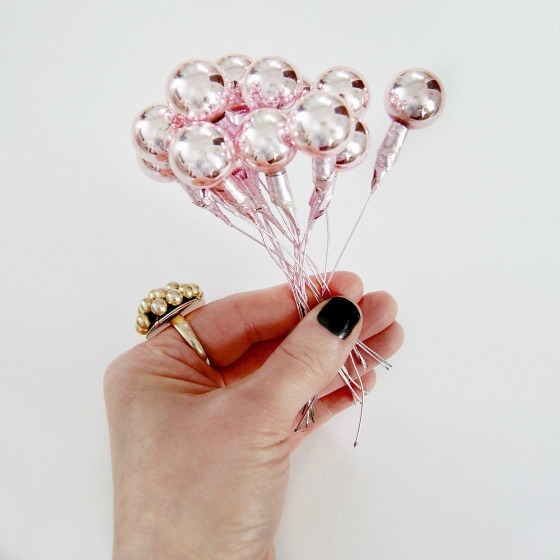 And despite that, we still jumped at the chance to participate when we were asked by our super talented friend Jennifer Perkins to be a part of this Valentine wreath blog hop sponsored by Treetopia. We just love all things Valentine's. It's one of our fave times of the year...one of the most visually appealing Holidays. And the whole concept of this blog hop is great. 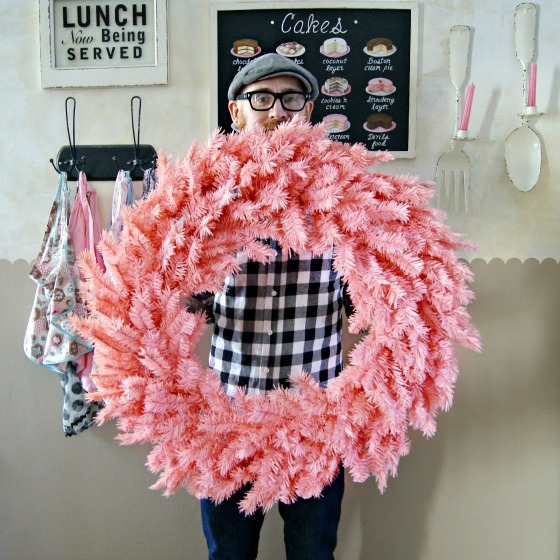 We got to have some fun with this giant pink wreath from Treetopia, and get crafty alongside a star studded lineup of super talented crafter/designers. And in the end, you readers will have FIVE chances to win a wreath like this of your own! 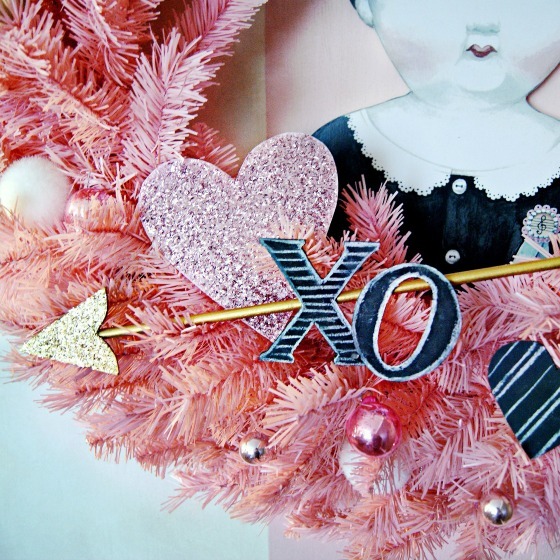 So…we stole a few hours out of our busy schedule and made our Charlotte Sweetheart wreath. So, like I said, the wreath is giant! When it arrived we were like yowza! We had only seen a pic online of the wreath and we couldn't discern the actual size. When the box arrived and we slid the wreath out we were thrilled at the size. What a room maker it will be! I immediately had the idea of the wreath acting as a frame for one of our wooden Charlotte plaques. 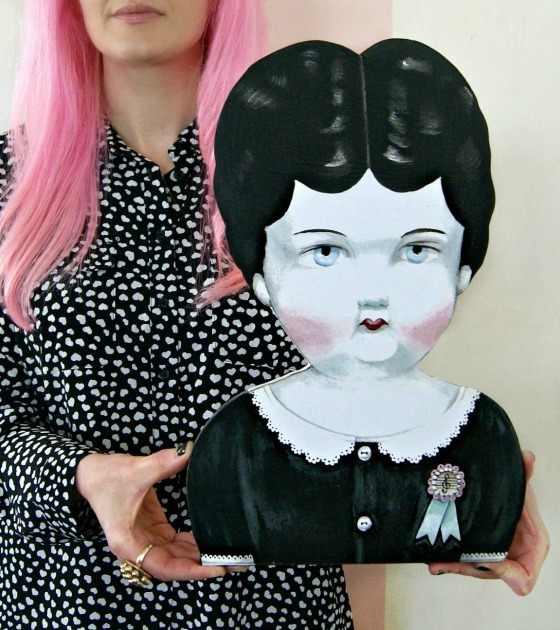 She's our mascot and we love to see her sweet face up on our living room wall. We are big time sketchers. Pretty much everything we ever design starts with a crude pencil drawing like this. We'll just jot ideas on the paper and slide it back and forth across the table to each other. Since we were going to have the matte black, chalkboard type elements, I grabbed these vintage wired pink balls and some other ornaments for pops of shiny color. And then we started cutting out mat board hearts, and also added some glitter. The arrow that we had sketched came together "in real life" fairly simply. We cut a wooden dowel to the right length, and then cut the arrow tip and end feathers from mat board. 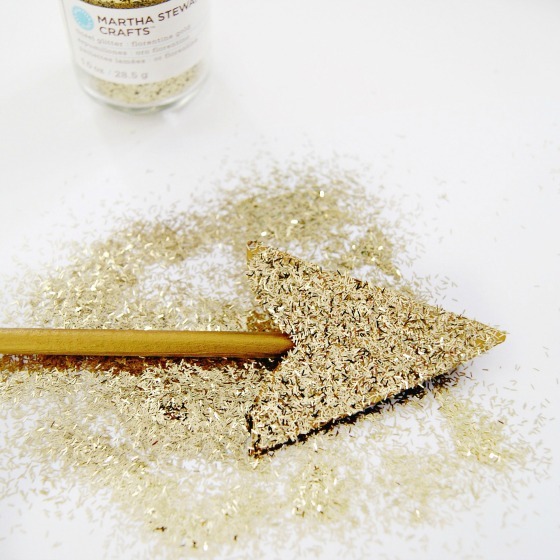 We painted all of the elements with gold acrylic paint, attached the tip and feathers to the dowel with hot glue. 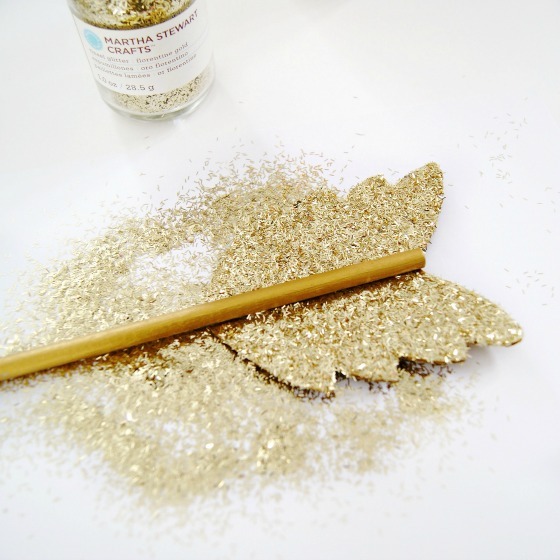 Then we glittered the tip and the end feathers. We love black! We always use it to balance our pastels and candy colors. 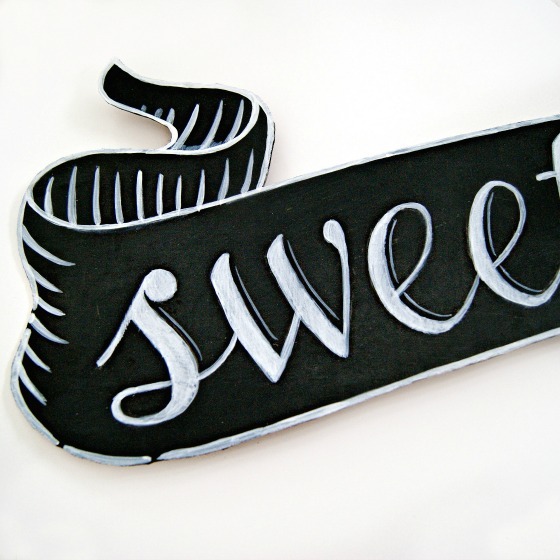 And we love chalkboard art and lettering. So we decided to go with a black chalkboardesque banner to bear our wreath's "statement". 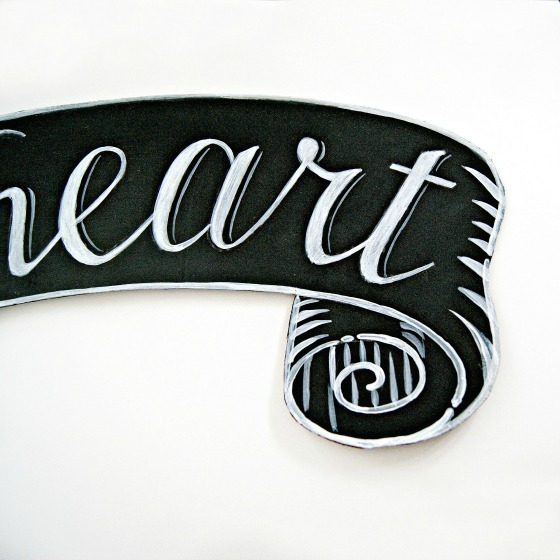 The banner is cut from a cardboard box, and then we painted it with black acrylic craft paint. The lettering and line work is done in white acrylic paint. The first things we added to the wreath were the balls…some little pink ones, some slightly bigger pink, glittery gold, and a few white fluffy snowballs. Our Charlotte plaque is actually hung right on the wall. To balance out the banner up top we added the arrow and the X O to the bottom portion of the wreath. 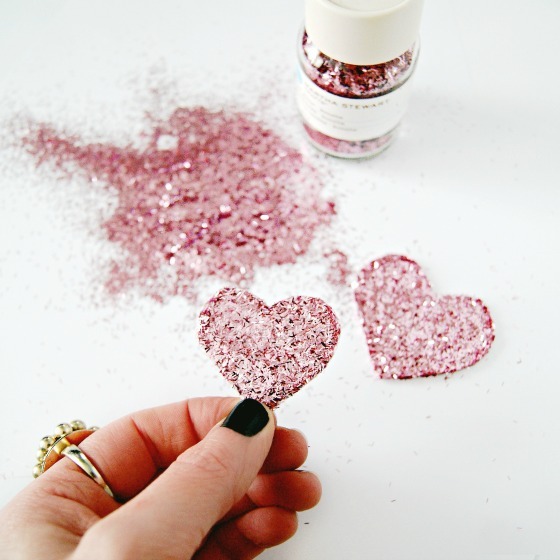 And the big pink glitter heart was so so necessary. The X O and the black hearts were also just cut out of mat board, which we painted black and then decorated with sketchy chalk details. We just added some bakery twine to the back of the banner and hung it on the top branches…this way we could always remove it and use it for something else. The whole wreath came together in just a few hours. It was really fun to do, and it looks so so fun hanging in our living room! We hope you guys enjoyed this little show and tell! 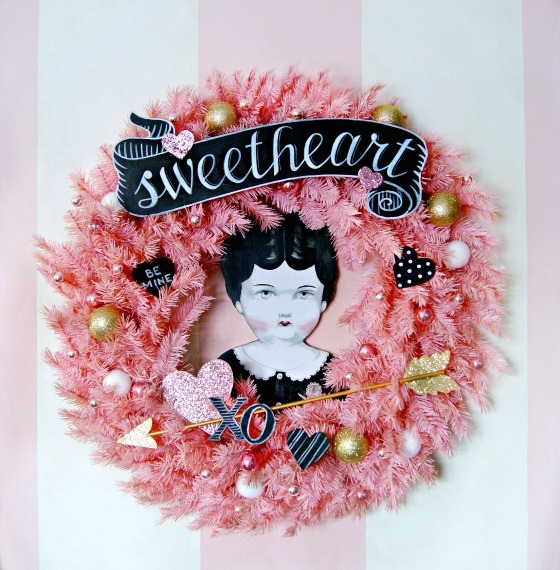 We love the quality of this Pretty in Pink wreath. There are pre-lit wreaths & garlands available too! You can find them here. Or, like I said up top...If you'd like a chance to win your very own wreath! Entering is super easy! You can enter below on this post, and also visit the other posts to check out their amazing creations, and enter on their posts as well! 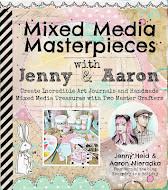 And be sure to visit the Treetopia blog to continue the blog hop tomorrow!! I WANT THAT WREATH......that's just all there is to it!, OMGorgeous! beautiful wreath guys! who wouldnt want to win one. you did a great job with it, now I have to check out the others! Happy day! Wow wow wow!! As a lover of all things PINK, this is simply AMAZING! I love it!!!!! I can feel the love! I think one of my favorite valentine memories was when we found out we were going to be grandparents For the first time! And fast forward. ..today we head to a dr appt to hear the same news, yet again! ! This lil one COULD be born with pink hair (or blue) as he or she has a mommy that's an amazing stylist! Happy valentines!! OMG I would love this wreath Thanks for the chance to win going on the other blogs to enter as well! My favorite memory was my first one with my husband we went to a restaurant and he already had flowers waiting on the table for me! Wow you and Aaron hit that wreath out of the ballpark. That is beyond amazing. I had not seen this site with the wreaths and their colors are crazy cool...thanks for the heads up on that. What a beautiful wreath! I have the matching pink tree. When my husband I celebrated our first Valentine's day - I worked at the grocery store. There were these huge five foot tall signs that said I LOVE YOU hanging from the ceiling in each aisle. I asked to take one home at the end of the day on Valentine's Day. When I got home, I hung it from the doorway so when he walked in he would be SURPRISED with my LOVE. He didn't even notice it...... So, even though that sounds sad, that is still my favorite Valentine's Day memory because I learned that he isn't into holidays, but then again, he doesn't mind that I go overboard about them. My favorite valentine memory is from all the way back in high school, believe it or not! I didn't have a significant other/valentine that year, but helped the FHA bake and deliver mini heart shaped cakes to unsuspecting students, staff and teachers for a majority of the day. Every single recipient was THRILLED with the sweet surprise, and I ended up feeling so good and somehow included in the one holiday that was typically filled with high expectations, drama, and crushed feelings. Thanks for sharing the love, AND the wreath! When I was in grade school we hand-crafted Valentine's boxes and left them in our homeroom. Throughout the weeks leading up to Valentine's Day, we all left valentine cards and candy and little surprises in other kids' boxes. Thus began my love affair with crafting. I loved seeing how differently and wonderfully all the boxes were decorated. So much fun! Definitely the first Valentine's day with my then bf now hubby. He took me to dinner, gave me a ring and a beautiful handwritten note. I'm thrilled we're celebrating our 23rd Anniversary this year! Hi Jenny! That wreath is fabulous!!! Love how huge it is and of course I love that it's pink! You made it so cute with your decorations! Oops! Forgot to tell you my fave Valentine's memory. Last year my boys and I had a Valentine's Day party! I filled little mailboxes with candy for each of them and my 12-year-old played dj by playing music for us. It was mostly video game music and some funny voice recordings of himself and his brothers. We laughed and danced and ate candy. It was so fun! I also remember how my mom would always decorate for holidays when I was little. She didn't do a lot for Valentine's Day, but she did cover the top of our giant cabinet televison with decorations. I always loved that she decorated for holidays. I love the way you decorated it for Valentine's Day! I would love to win one! My favorite Valentine's Day moment is when I shared the Holiday with my son when he was little. 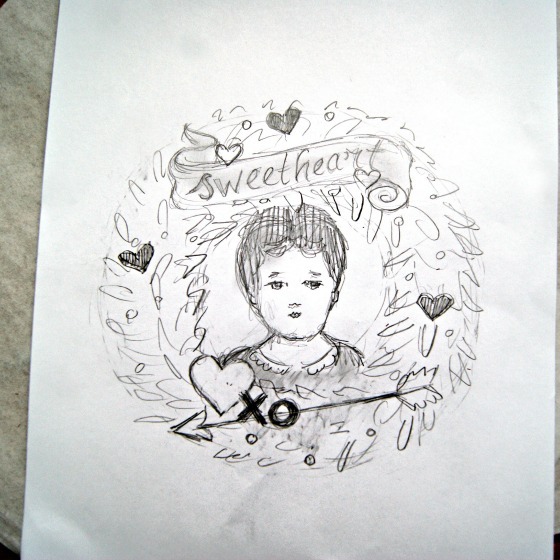 He love's Holidays like I do and always was excited on Valentine's Day and we would create Valentine's together. 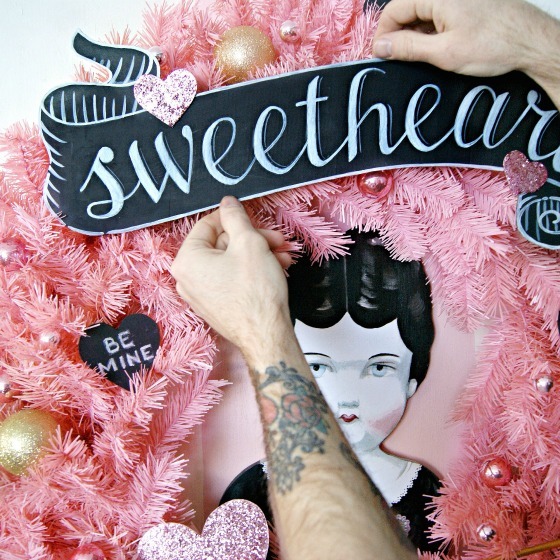 I love, love, love, that wreath being the pink girl I am, it would look so awesome in my craft space. 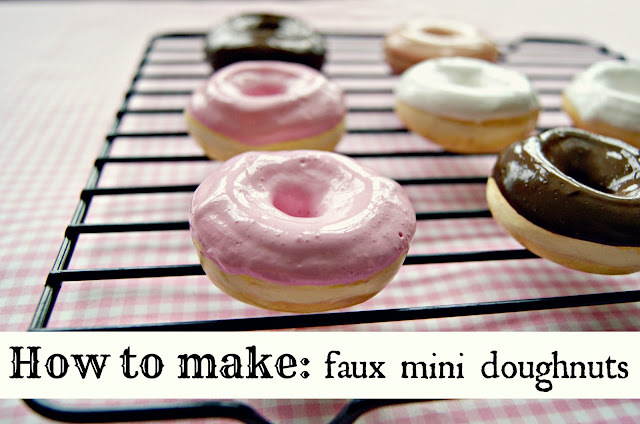 Yours turned out super cute. That wreath is AMAAAAAAZING!! Wowza! I love the wreath! The Charlotte is just to die for. My favorite Valentine memory has to be from last year. It was the first year my daughter made me a Valentine all on her own, no help from Daddy. Something about kid's drawings gets me every time. my favorite valentine's was having a valentine lunch for friends! My favorite Valentines memory is when a boyfriend in high school gave me a giant bag of just orange conversation hearts- the only ones I like. He had his whole family eating the other colors to make it. Okay, this is my favorite wreath so far! I love the simplicity and vintage feel. 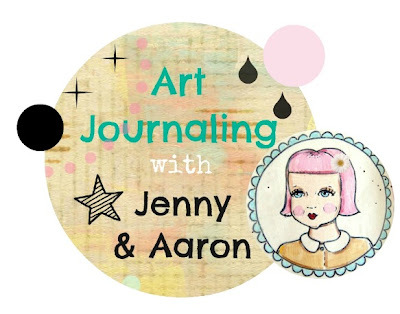 I'm also super glad I discovered your blog through Jennifer Perkins' blog. Cute! I love the chalkboard details. Its so pretty, Love all the Detail!!! If I win, this will be my happiest memory...sad, huh? But true! Thanks for the op! Wild thangs, yall make my heart sing. Yall make everything groooovy. My favorite V-day was the first one with my boyfriend! He put love notes all over the house. Love the wreath! One of my fave memories is of my mom sending Valentine cards to family and friends. It's been three years since she passed and I think of that fondly & think I might carry on that tradition. 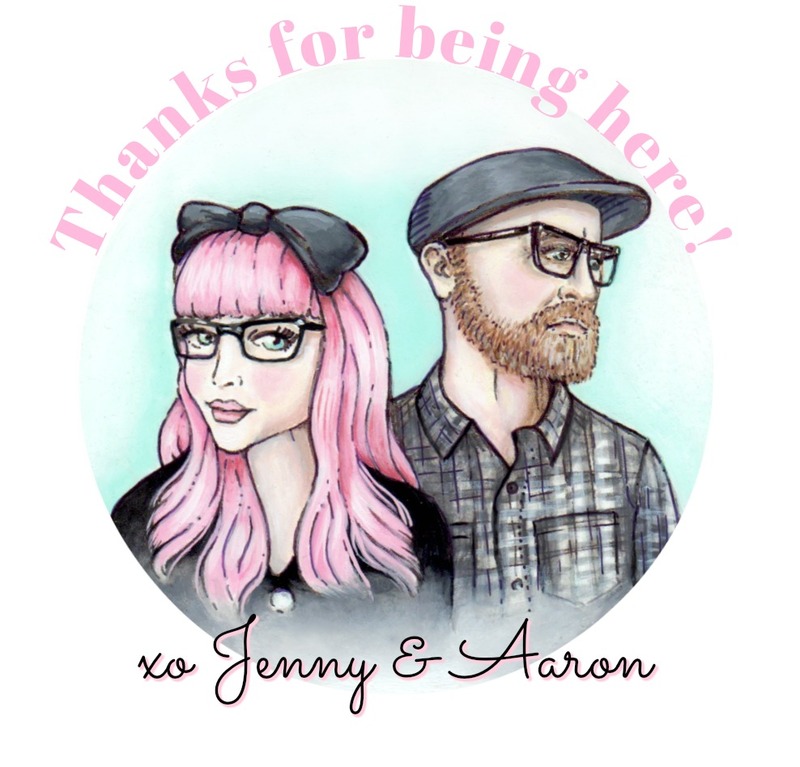 Oh Jenny and Aaron - this is just "adorb" as they say! Love all of the elements! She is a real Sweetheart! I love Charlotte! She looks so proper with a touch of adventure in her eyes! Oh my gosh! This is sheer cuteness!!! Thank you so much for the chance to win!! Be still my heart!!! Your wreath is sooooooo beautiful!!!! I love that y'all make a sketch and slide it back and forth to eachother to add your own parts! My favorite Valentine memory would be when I was in 9th grade, my Daddy sent me roses to school on Valentines Day, I felt so very special and loved! I still have the card he attached to the roses to this very day! So precious to me! I hope y'all have a Happy Valentines Day!!!! Thanks for sharing so much beauty with us all!!! Love the size. One and done decorating. Sooo, amazing! My favorite Valentine memory is the singing stuffed hound dog hubby gave me! When I was very little my family lived next door to a family with 2 boys about similar ages to me and my sister. Every Valentine's Day there would be a shy knock at the door and they would be stood there with heart-shaped cakes and a bag of candy for each of us. They were the sweetest boys and we're all still friends now, 20 years later! Hello giant pink wreath! My fave memory is my first Valentine's Day with my husband when we had first started dating. We went to a club and he would not dance, HA! He went because I loved dancing but he hated it, ha! I just remember him hardly moving and me trying to get him to dance. It still makes me laugh! My favorite Valentine memory was when my darling Jim proposed to me! He'd cooked this awesome dinner, we dined by candle light with soft music in the background, then he got down on one knee and said the most beautiful words I'd ever heard! He them pulled the gorgeous engagement ring he'd helped design and my heart just melted away! We've been married 15 years now and he's still as romantic as ever! I love the wreath upi and Aaron made. It's a great reflection of your styles. My favorite Valentine's Day memory was holding my one day old twins. They were due on Valentine's Day, but arrived a day early. Receiving a huge bouquet of roses one Valentine's Day! My fave memory is when my husband and I went out for our first valentine's day date. We just started dating, so this was our first date. We tried to go to a fancy restaurant, but the wait was 2 hours. We tried a few other restaurants, but the wait was still too long. We ended up at Red Lobster. It was fun and funny night.